Crispy bacon, fruity stinky Taleggio cheese, light and airy Ricotta, fresh spinach and fragrant basil get grilled between two olive oil and red pepper flake infused slices of Focaccia. This crispy creamy sandwich is truly something that will change the way you think about pizza and grilled cheese forever. 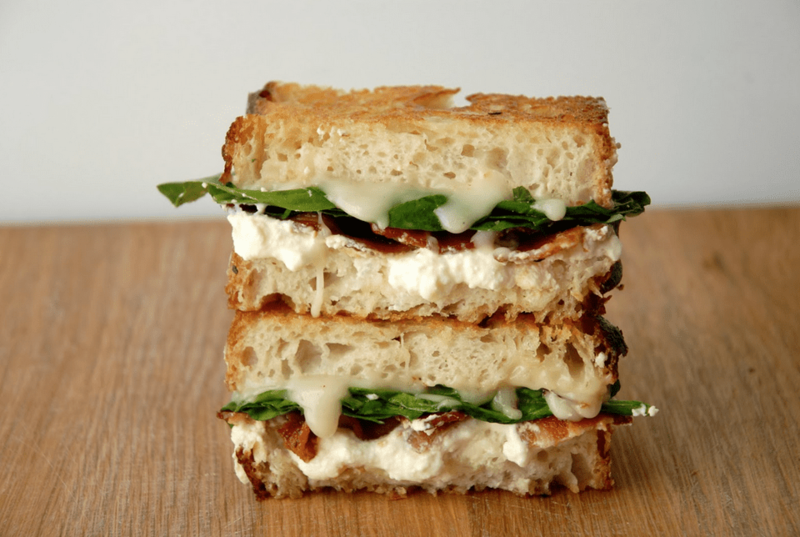 Swap out ingredients to make it your own - but don't back out on the Taleggio - it makes the sandwich irresistible! Begin by assembling your sandwich. Smear Ricotta onto one slice of bread and top with bacon. Add the basil, the spinach, and the Taleggio. Top with the other piece of bread and set aside. In a medium sized skillet, add olive oil and red pepper flakes and heat over medium for a few minutes until the flavors start to meld and become fragrant. Add the sandwich to one side of the pan and cook for a few minutes until a beautiful golden brown crust starts to develop. Flip the sandwich to the other side of the pan, making sure to smudge it around, sopping up of the remaining red pepper flake infused olive oil. Once that side becomes golden brown and the taleggio begins has melted remove the sandwich from the frying pan and set aside for a minute or two before devouring.